The most recent survey by the National Association of Colleges and Employers tells us that to be successful, graduating seniors need to be able to make decisions and solve problems, communicate effectively and work well with others, make plans and prioritize, and have good technology skills. The iPad has helped my students be successful in all of these areas. Let’s start with problem-solving. As mentioned above, I always encourage my students to find their own answers. That means it’s also up to them to find the best sources to support those answers. Recently, in a discussion on Plato’s Republic, Augustine’s City of God, and The Rule of St. Benedict, my students were trying to decide whether “equity,” “justice,” and “fairness” were really just different words for the same concept. After looking at a few different sources, they decided that the Oxford English Dictionary would be the most helpful since it shows how a word’s meaning changes over time. Even though the texts we were discussing pre-date our language, seeing how these words were used in the past helped them grasp the differences among the concepts. The iPad makes it easy to access different resources in our library, on our class Blackboard site, and on the internet; this broad access means that they have to make a real decision rather than choosing from resources that I have already vetted and provided for their use. It’s easy to see how this exercise is directly related to communicating and working with others. Group work in my classes ranges from simple, in-class exercises to major projects that take weeks of work and planning to complete. Students can use iCloud, Google Docs, and Dropbox to share research and documents; they can use messaging and calendar apps to keep up with each other and arrange meetings. It’s great to see them collaborating on documents without the barrier of a laptop screen getting in the way of conversation. The iPad also allows them to share their work in something other than a standard essay or in-class presentation. The jobs of the future will require students to produce video, to create documents and websites that integrate words and images. The iPad helps them to practice those skills now. Creating projects together means that everyone can bring their own strengths to the table, and everyone can learn from their colleagues’ skills and knowledge. Students who thoughtfully involve themselves in this kind of communal work are also more willing to stretch the boundaries of their learning in other areas. In their writing, they embrace creative approaches rather than relying solely on what they already do well. In their reading, they take risks and share their own interpretations rather than waiting for someone to tell them what the “right” answer is. Because the iPad is integral to these learning experiences, it helps students feel confident in their use of technology. Despite the claims that today’s college students are “digital natives,” the evidence among my students suggests otherwise. Using technology well—so that it is an effective and an efficient tool—is a skill. Like writing, public speaking, or calculus, it’s something that must be taught not just in terms of how to do it but also why it’s important. And because the iPad helps my students with so many of the skills that they will need in their lives after college, it’s easier for them to understand why it’s a skill worth mastering. so, what exactly do we do with the iPad? 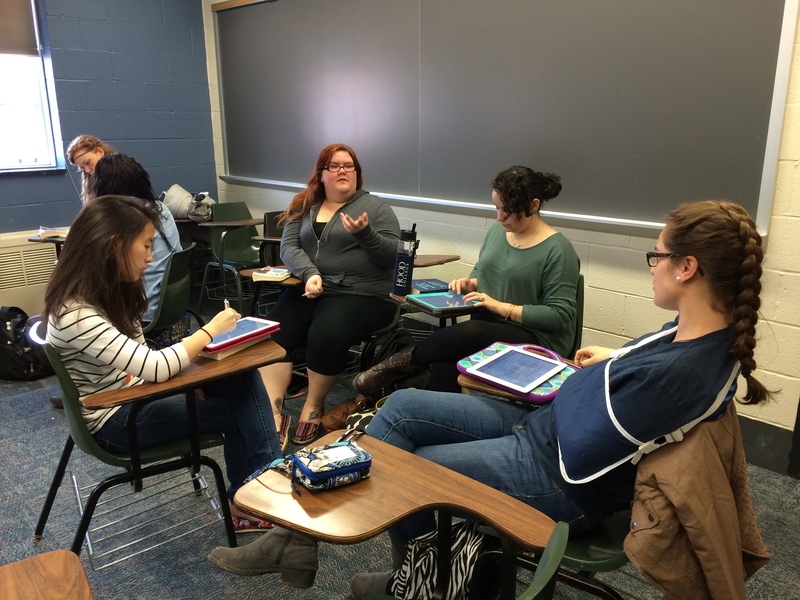 My Spring 2012 course, “Vampires in Folklore, Fiction, and Film,” was one of Hood College’s first iPad pilot courses, and I have been exploring how the iPad can challenge students to become more active participants in their own learning ever since. 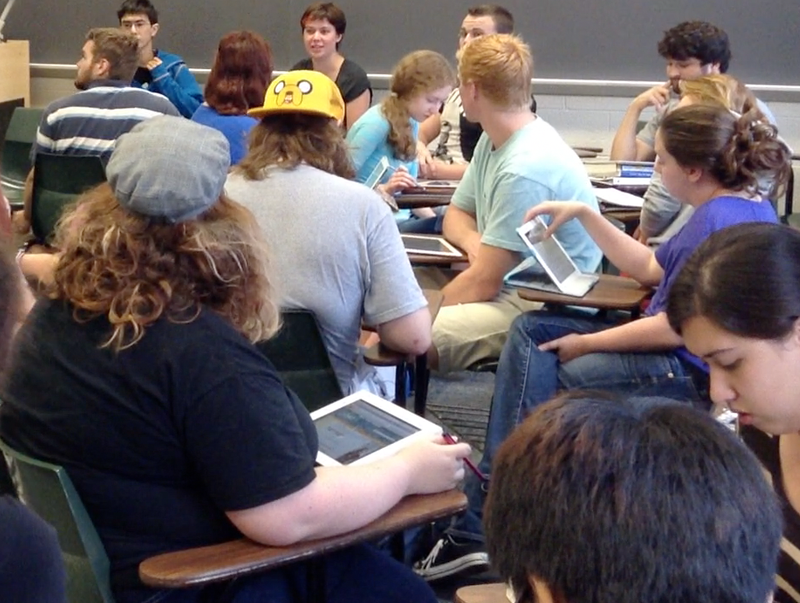 Now that Hood gives an iPad to all undergraduates, students in my classes use their iPads every day. 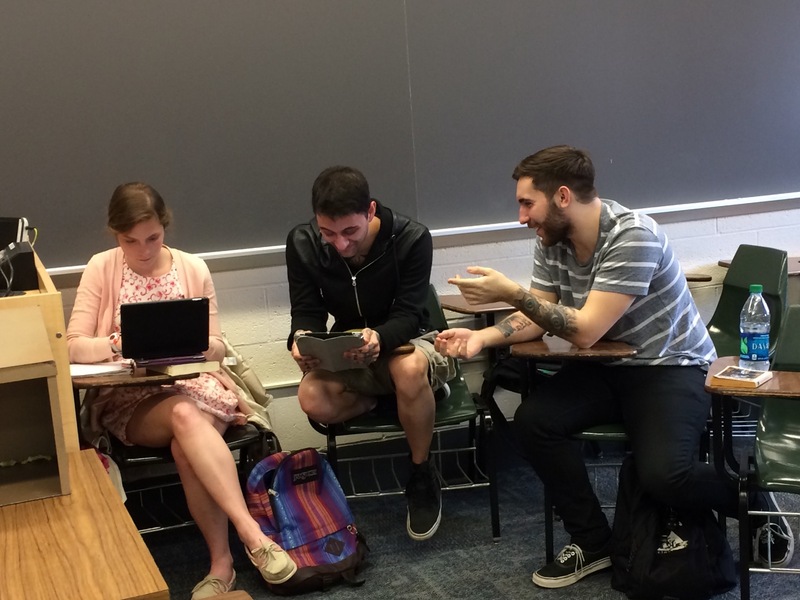 The iPad helps them make the most of digital resources like e-books, apps, and the Blackboard course management system as well as improving access to course blogs and other online projects that keep collaboration and conversation going outside of class time. I’m always experimenting with different ideas. Sometimes it’s something simple, like using Apple TV to allow me or student presenters to get out from behind the podium, or adopting apps to make content more interactive. Many students think of reading books and watching films as passive activities, but the iPad has helped me encourage my students to make their encounters with texts more active. The highlighting and notes features in eBook apps (iBooks, Kindle) and PDF annotation apps (GoodReader, Adobe Reader) make it easy for students to annotate their readings and then access their comments and questions for class discussion and writing assignments. In informal polls (conducted via the not-so-scientific method of “close your eyes and raise your hand if you agree”), nearly every single one of my students say they take more notes when reading on the iPad than they do when reading in a paper textbook—music to the ears of any teacher! When watching films for class using iTunes or Netflix, students can take screenshots (simple on the iPad; challenging at best on a laptop or desktop computer) of key moments to facilitate discussion. Other times, the result of my experimentation is a complete redesign of an assignment or even an entire course in order to take advantage of the possibilities that the iPad has to offer. All of my syllabi now include at least two multimedia projects that were much more challenging (if not impossible) before my students had iPads. In my introductory courses, the influence map project gauges my students’ knowledge on a topic at the beginning of a semester by asking them to make an argument visually, with a collage of images, rather than verbally. The iPad and apps like Photo Wall HD allow my students to quickly and easily show me their understanding of major topics like “magic,” “the vampire,” or “England.” Seeing what my students know, what images and ideas they associate with the subjects we’ll be discussing, helps me to provide the foundation that they need to master our course material. The iPad has helped me re-imagine more “traditional” projects as well. In some classes, students give a “poster-style” presentation of their individual research on final exam day; the iPad brings this traditional academic staple into the 21st century, allowing students to share their findings using a combination of images, text, sound, and video. In my “History of the English Language” course, students make videos using iMovie to demonstrate their proficiency in Middle English pronunciation. And I’m especially looking forward to the final projects in my “Exploring Utopia” class this semester; students will work in groups to create a travel brochure and video for their own version of Utopia. I can’t wait to see what exciting new worlds they will create based on our semester’s work together! Transformation is a tricky thing—it’s about questions, about process, about discovery. When those around you are focused on results, on products, on the bottom line, transformation can seem like an intangible, unmeasurable luxury. But without it, how can we move forward? How can we get our students to take ownership of their own learning? How can we help them find their own, creative answers to challenging questions? How can we prepare them for the jobs of the future and help them to build a life that is productive, thoughtful, and engaged with the world in which we all live? My job as an educator is to focus on the process, on the transformation, because I believe that the results will inevitably follow. Learning is an active process of reading, thinking and writing. It’s a collaborative process that requires each of us—students and professor alike—to take account of the needs of our fellow learners as well as ourselves. And it’s a risky process, because the only place to find new knowledge and new skills is at the edge of our comfort zone. Transformation is what happens when students embrace all three of these aspects of learning, when they realize that the lessons they learn from me are applicable beyond the walls of the classroom. Many students are surprised that I emphasize how my classes will help them in their life beyond college. Because I teach medieval literature, they expect that my classes can only be about the past, rather than also offering lessons about the future. But the two can and should be connected. When I assign a blogging project in which students are responsible for helping teammates remember their deadlines, I am also teaching them medieval ideas about what it means to live and work in a community. When I assign Twitter essays that emphasize brevity and concision, I am also teaching them how challenging it was for medieval scribes, whose writing materials were valuable commodities that could not be wasted. Another surprise for my students and colleagues is the extent to which technology is integrated into my teaching. I’m not sure why people expect medievalists to be Luddites; fear of technological innovation is largely a modern phenomenon (unless you count that hilarious Norwegian “Medieval Helpdesk” video that made the rounds on YouTube a few years ago). Today’s students have access to more information and more learning opportunities than ever before, so we must help them understand why all sources are not created equal. We must show them how to choose the “right” information as opposed to merely the first search result. I know many teachers work hard to keep technology out of their classrooms because they fear the temptations of distraction, but I want my students to take advantage of all the tools at their disposal. I want them to practice the ever-trickier art of information discernment. I require my students to bring their iPads to class every single day and encourage them to try and answer one another’s questions as often as possible rather than looking only to me for answers. This way, my students will not only learn how to find the resources that they need, but will also feel empowered to move beyond the limits of my knowledge. Because the ultimate transformation in education is when our students start to ask their own questions that will broaden the horizons of future generations.